The self-explanatory Mix Lens is one of the factory Lenses. Find out how Sonar’s new Lens feature can help you. Sonar’s new ‘Lenses’ feature provides a functionality that’s similar to what other programs call ‘workspaces’, but Sonar’s implementation takes the concept even further. Since the object of the new feature is to provide a focus for specific types of workflows, ‘Lens’ seemed an appropriate name! The aim of Lenses is to streamline the user interface for the task at hand. 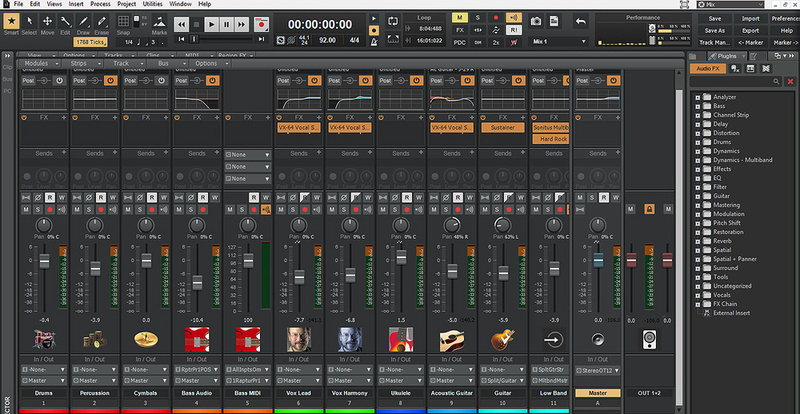 For example, if you’re mastering in Sonar, you probably don’t need anything that relates to MIDI, video or mixing. Or if you’re just tracking, all you really need is the Track View and the Control Bar — you won’t be fine-tuning ProChannel processors, so they needn’t take up UI space. Lenses are designed to tailor the program to your particular needs at any given moment; although a Lens preset is global and affects whatever you’re doing, you can switch Lenses any time. \Roaming\Cakewalk\SONAR\Lenses\Factory). These can’t be overwritten, but you can add to them with the ‘Save As New Lens’ command. You can also create your own via the Lens Manager, and those get saved in the folder AppData\Roaming\Cakewalk\SONAR\Lenses\User. Note that although there are preset Lenses for Sonar Home Studio and Sonar Artist; only Sonar Professional and Sonar Platinum let you create, edit and save your own Lenses. 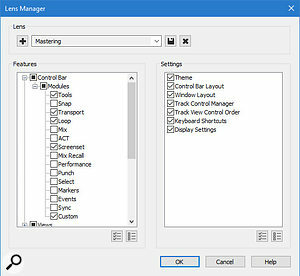 The Lens Manager can include or exclude particular Sonar elements from a Lens.Lenses are more than just a variation on Screensets. Before Lenses I had different Screensets for specific applications, which used up my 10 Screensets fairly quickly. A Lens is more like a master, global Screenset — and that has changed my relationship to Screensets. Remember that Screensets are saved per project, and that you can import a Screenset from any project. Because Lenses now make me think more in terms of using Sonar for a specific type of project, starting with an appropriate Project Template has become more important. The templates include an associated Lens, and Screensets optimised for that type of project. I’ve already created Lenses for mastering and looping (as described next), and I’m sure that when it comes time to do my next audio-for-video project, I’ll take the time to create a Project Template for that as well. 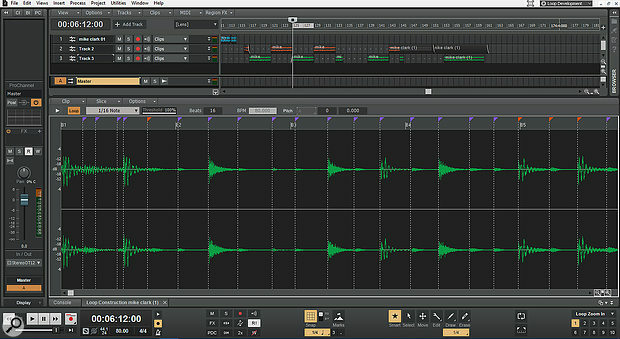 I’m doing more and more mastering in Sonar these days. One reason is that I can master the raw stereo mix, and then bounce it to a finished track. I’ll often do several mastered tracks, then compare them and choose the favourite (as well as ‘splice’ different sections together — for example, I might like the verses in one master, but the solo better in another). As luck would have it, the Lens feature appeared just before I was due to master the upcoming album Trigger from Bryan Ferry’s lead guitarist, Quist. I suspected creating a mastering Lens with associated Screensets would smooth the workflow, and it did. The Mastering Lens applied to the cuts in the Trigger album by Quist. The top part shows the raw cuts, which, after mastering, are bounced to final tracks for comparison to each other and the raw versions. 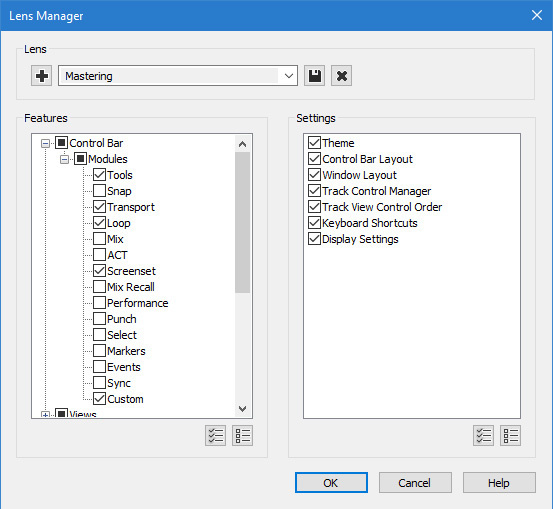 In the Lens Manager, you have the option to exclude/include Features and Settings. Starting with Features, the Control Bar was the first candidate for simplification by trimming unneeded modules: Snap, ACT, Mix Recall, Performance, Punch, Select, Markers, Events, and Sync. I did, however, need to include Loop because I often loop a section with a particular issue (like a resonance) that needs to be addressed, as well as Mix, so that I could select between Solo and Exclusive Solo modes. As to Views, I banished anything related to Surround Sound, Video or MIDI. However, Screensets were definitely worth keeping for zooming in, zooming out, opening the Browser to drag in effects or save finished versions to the Master Versions folder, etc. Lenses also allow removing Track Controls, most of which aren’t needed for mastering, as well as letting you reorder them. As to Settings, the Lens needed to include all the elements. However, I also wanted a very specific window layout with as much space as possible to see the tracks, while the Inspector needed to be only wide enough to see the Master mixer channel. I also like seeing a lot of tracks, because in album projects (they still exist!) 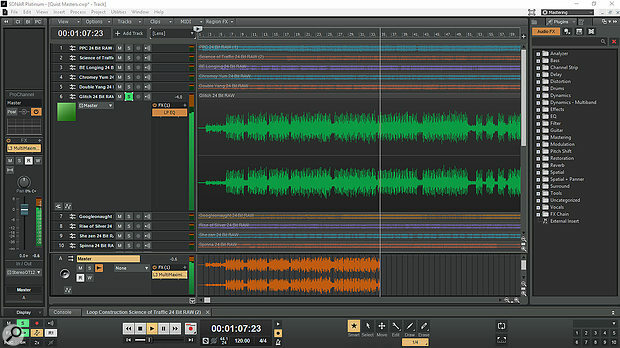 Exclusive Solo is essential to compare levels and response among not only raw and mastered versions of the same song, but also different songs. Concurrently with mastering Quist’s project, I’m also doing a loop library with legendary jazz/funk drummer Mike Clark (probably best known for his work with Herbie Hancock). Once again, Lenses to the rescue — they really streamlined the loop development process. Optimising the Screensets for that particular Lens was particularly valuable; I could zoom in on the Loop Construction View, zoom out, save loops to the Browser, and the like. The Track view at the top shows Mike’s playing being split into loops. One of them is being turned into a Groove Clip in the Loop Construction View. There’s nothing quite like a little focus to make life easier! And now with WASAPI (see box), I can edit Mike’s loops away from home. Goodbye, old-school native Windows audio drivers — you can finally uninstall ASIO4ALL from your laptop, and stop cursing at MME — because WASAPI (Windows Audio Session API) drivers can now reduce latency dramatically with integrated soundcards compared with these other two driver types. The main advantage I see is for laptops; with external interfaces we already have ASIO (although you can use external audio interfaces if they have WDM drivers that can talk to Windows via WASAPI). I’m particularly excited about WASAPI because I travel a lot, and it means I no longer have to bring an ASIO interface if I want to do serious work while on the road. I measured the round-trip latency of my laptop’s internal soundcard by creating a click in Sonar, feeding it to headphones, then holding the headphones up to the laptop’s mic. The delay was typically 6-8 ms. While USB 3.0 or Thunderbolt can be faster, that’s still better than quite a few USB 2.0 ASIO interfaces because there are no USB ‘layers’ between the drivers and the audio. Also, when using Sonar’s virtual controller (either with the touchscreen keyboard or typing on a QWERTY keyboard), there was no more annoying 40ms delay from the prehistoric MME drivers. Sonar can access two different WASAPI modes, as chosen in Preferences (the same way you’d choose any driver model). 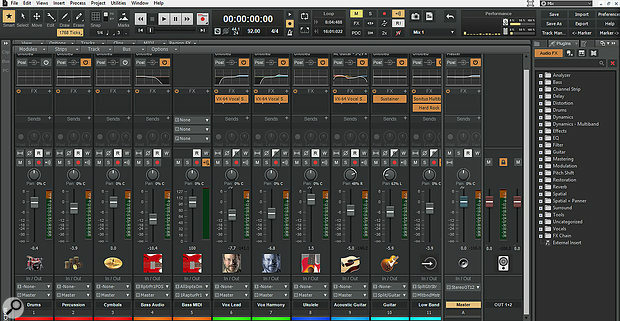 Exclusive mode provides the lowest latency, and gives exclusive audio control over to Sonar. Shared mode acts more like traditional WDM because it can aggregate multiple inputs. This means Sonar can be open while having, for example, a web browser open that’s playing back audio; one won’t ‘steal’ the audio away from the other. The latency is still relatively low, typically around 10-15 ms. However, if you want to mute Sonar when switching to a different audio application, choose Edit / Preferences / Audio, then Playback and Recording, and tick ‘Share Drivers With Other Programs’. 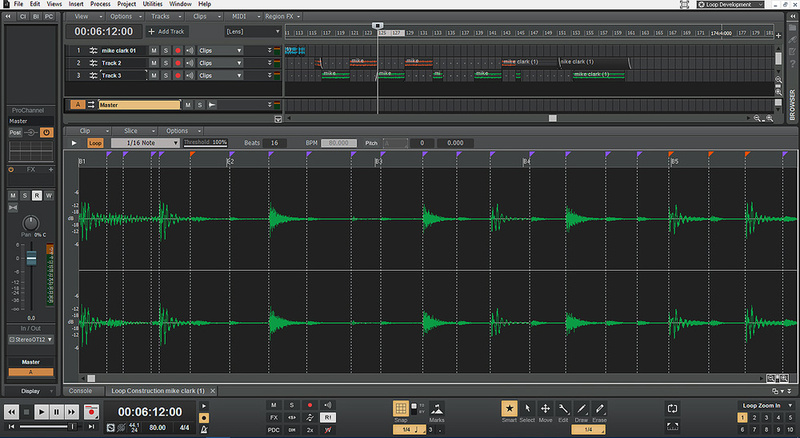 As soon as Sonar loses the focus in Windows, it will no longer access the audio device. Note that, unlike ASIO, the latency is the same regardless of the sample rate, so you can’t increase sample rate to decrease latency. For example, on my system, sample buffers were 132 samples for 3ms at 44.1kHz, and 288 samples at 96kHz — for 3ms again. In the context of a laptop with no annoying latency at any sample rate, that’s more than acceptable to me. You don’t even need an audio interface to provide decent mic preamps and converters, because a new generation of higher-priced USB mics now include quality electronics. Furthermore, because there’s no significant round-trip latency, you’re no longer forced to use a USB microphone’s onboard zero-latency monitoring.